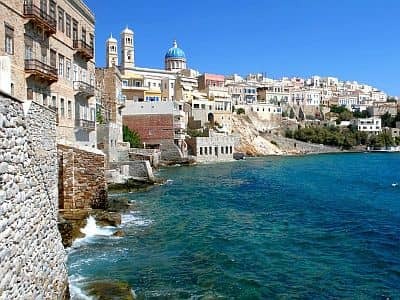 In Syros, a small Greek island belonging to the archipelago of the Cyclades, the climate is Mediterranean, with mild and rainy winters and warm and sunny summers. The daily average temperature ranges from 10.5 °C (51 °F) in January to 25 °C (77 °F) in July. The island is windy. In autumn and winter, the wind blows in periods of bad weather, either the mild southerly wind preceding Atlantic disturbances, or the northwest wind brought by cold outbreaks from the Balkan Peninsula. On the other hand, in summer the Meltemi dominates (see below). The rains follow the Mediterranean pattern, in fact they are concentrated from October to March, and are not abundant, since they amount to 475 millimeters (18.5 inches) per year, and this is confirmed by the aridity of the landscape. Winter, from December to mid-March, is mild, rainy and windy. The wind, frequent and sometimes stormy, heightens the feeling of cold. There is a moderate amount of mild days, with highs around 16/18 °C (61/64 °F), but the island is located quite to the north and close enough to the mainland, to receive cold air with some frequency, to the point that there can be cold days, with highs below 10 °C (50 °F), and occasionally even snow can fall. Spring, from mid-March to May, is mild and sunny, but it is often windy. From mid-May the Meltemi starts to blow, an insistent wind, cool and dry, blowing from the north for some days in a row, especially during the day, but sometimes even at night. Summer, from June to mid-September, is warm and sunny, but also windy. The Meltemi blows for long periods, especially in July and August, and it's stronger in the afternoon but can insist also in the evening. With this wind, the maximum temperature usually remains below or around 30 °C (86 °F), and even in the hottest periods, when in other parts of Greece the temperature reaches or exceeds 40 °C (104 °F), here it doesn't go above 35/36 °C (95/97 °F). Autumn, from mid-September to November, is initially warm and sunny, and gradually becomes cooler and more rainy. Autumn too is windy: as long as the weather is good, the Meltemi still blows, while later the wind blows along with autumn disturbances. 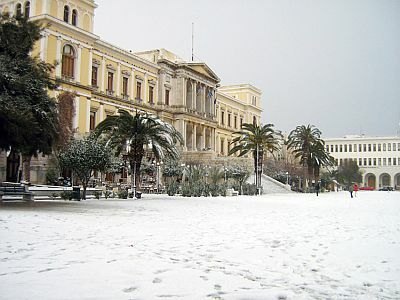 The amount of sunshine in Syros is great in summer, when clear skies prevail, while it is not high from November to February, when the sky is often cloudy, even though sunny days can present themselves also in midwinter. 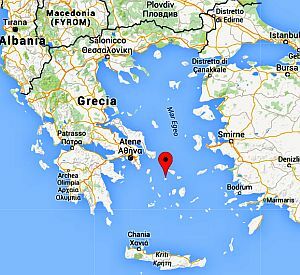 The temperature of the Aegean Sea is never very high because the wind that blows in summer tends to keep it a bit low, however, it reaches a maximum of 23 °C (73 °F) in July and September, and 24 °C (75 °F) in August; in June, it's still a bit cool, about 21 °C (70 °F). The best time to go to Syros for a beach holiday is the summer, from June to mid-September. In June, as we mentioned, the sea is cooler than in midsummer. It's better to bring a sweatshirt for cool evenings, which occur mainly in June, but given the intensity of the wind, those who are sensitive to cold can feel a little cool even in July and August, and thus can equip themselves also in these months. If you want to visit towns and to go hiking and walking, spring is fine, in April and May, but since it is normally not too hot, you can usually walk around the island also in summer, except in the rare hot and windless days.